Were Hedge Funds Right About Dumping Rogers Communications Inc. (RCI)? Rogers Communications Inc. (NYSE:RCI) has experienced a decrease in enthusiasm from smart money of late. RCI was in 13 hedge funds’ portfolios at the end of December. There were 15 hedge funds in our database with RCI positions at the end of the previous quarter. Our calculations also showed that RCI isn’t among the 30 most popular stocks among hedge funds. In the eyes of most market participants, hedge funds are seen as unimportant, outdated financial tools of the past. While there are more than 8000 funds with their doors open today, Our experts hone in on the leaders of this club, approximately 750 funds. These investment experts direct the lion’s share of the hedge fund industry’s total asset base, and by tracking their first-class stock picks, Insider Monkey has discovered numerous investment strategies that have historically outpaced the S&P 500 index. Insider Monkey’s flagship hedge fund strategy outstripped the S&P 500 index by nearly 5 percentage points per annum since its inception in May 2014 through early November 2018. We were able to generate large returns even by identifying short candidates. Our portfolio of short stocks lost 27.5% since February 2017 (through March 12th) even though the market was up nearly 25% during the same period. We just shared a list of 6 short targets in our latest quarterly update and they are already down an average of 6% in less than a month. 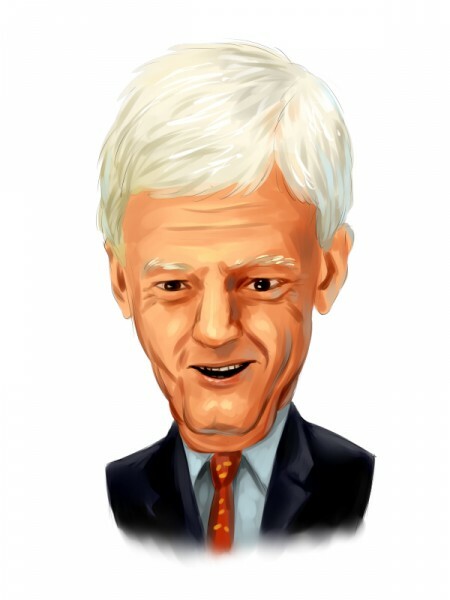 We’re going to review the fresh hedge fund action encompassing Rogers Communications Inc. (NYSE:RCI). How are hedge funds trading Rogers Communications Inc. (NYSE:RCI)? At the end of the fourth quarter, a total of 13 of the hedge funds tracked by Insider Monkey were bullish on this stock, a change of -13% from one quarter earlier. 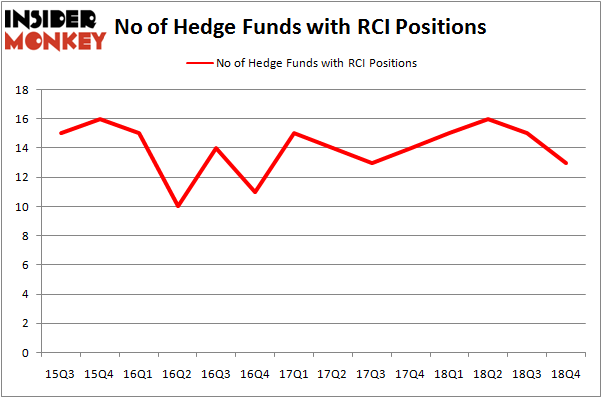 The graph below displays the number of hedge funds with bullish position in RCI over the last 14 quarters. With hedge funds’ capital changing hands, there exists a few noteworthy hedge fund managers who were boosting their stakes considerably (or already accumulated large positions). The largest stake in Rogers Communications Inc. (NYSE:RCI) was held by GLG Partners, which reported holding $246.3 million worth of stock at the end of September. It was followed by Renaissance Technologies with a $152 million position. Other investors bullish on the company included Two Sigma Advisors, AQR Capital Management, and GAMCO Investors. Seeing as Rogers Communications Inc. (NYSE:RCI) has experienced declining sentiment from the entirety of the hedge funds we track, it’s safe to say that there lies a certain “tier” of money managers that slashed their entire stakes in the third quarter. It’s worth mentioning that Paul Marshall and Ian Wace’s Marshall Wace LLP dumped the largest investment of all the hedgies watched by Insider Monkey, worth about $15.6 million in stock. Michael Platt and William Reeves’s fund, BlueCrest Capital Mgmt., also said goodbye to its stock, about $1.7 million worth. These transactions are intriguing to say the least, as aggregate hedge fund interest fell by 2 funds in the third quarter. Let’s check out hedge fund activity in other stocks similar to Rogers Communications Inc. (NYSE:RCI). We will take a look at Eversource Energy (NYSE:ES), Concho Resources Inc. (NYSE:CXO), Royal Caribbean Cruises Ltd. (NYSE:RCL), and Spotify Technology S.A. (NYSE:SPOT). This group of stocks’ market caps are similar to RCI’s market cap. As you can see these stocks had an average of 38 hedge funds with bullish positions and the average amount invested in these stocks was $1392 million. That figure was $519 million in RCI’s case. Royal Caribbean Cruises Ltd. (NYSE:RCL) is the most popular stock in this table. On the other hand Eversource Energy (NYSE:ES) is the least popular one with only 20 bullish hedge fund positions. Compared to these stocks Rogers Communications Inc. (NYSE:RCI) is even less popular than ES. Our calculations showed that top 15 most popular stocks among hedge funds returned 19.7% through March 15th and outperformed the S&P 500 ETF (SPY) by 6.6 percentage points. Unfortunately RCI wasn’t in this group. Hedge funds that bet on RCI were disappointed as the stock returned 6.8% and underperformed the market. If you are interested in investing in large cap stocks, you should check out the top 15 hedge fund stocks as 13 of these outperformed the market. Here is What Hedge Funds Think About AutoZone Inc. (AZO) Were Hedge Funds Right About Souring On Canon Inc. (NYSE:CAJ)? Is IQVIA Holdings, Inc. (IQV) A Good Stock To Buy? Hedge Funds Dropped The Ball On Fortive Corporation (FTV) Here is What Hedge Funds Think About BT Group plc (BT) Were Hedge Funds Right About Flocking Into Sempra Energy (SRE)?